Wheel House Designs has been designing socks since 1989. Right from the start, the cow sock put them on the map as being an innovator in the novelty sock industry. They now offer over 450 design ideas. They are proudly MADE IN THE USA. Most of their socks are Lightweight or Ultra Lightweight cotton. Cotton is widely preferred for softness. Nylon is used for strength and spandex is great for stretching power. The brilliant colors show detail in their designs. Lightweight Stretch cotton is great for form fitting socks. Each pair is made with high quality soft cotton which has great stretching power wash after wash. The colorful motifs certainly make a fashion statement! This style goes with a wide variety of shoe styles, especially sandals. They do not try to compete with overseas mills. Made in the USA has always been their passion and in today's world, that is a priority on the minds of their customers. They are proud of their quality and use soft cotton, vivid colors and great artwork to set them apart from the rest. They have been designing socks since 1989 and their name is well known across the country and beyond as being a leader in the sock industry. They value staying in the specialty market for it is what they do best. 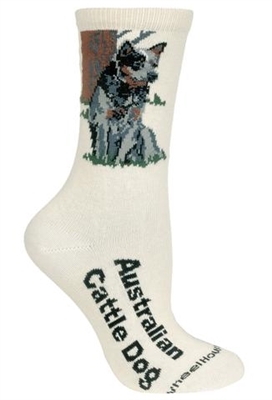 I ordered these for a Christmas present...my neighbor has 3 Australian Cattle Dogs and I think she's going to love the socks. I hope they fit!